If you’re hungry, you should eat. You just have to be conscious of how much and what you’re eating. Many experts believe that it’s not the big meals of the day that tip us over into calorie excess, but it’s those mid-morning and mid-day snacks that are the true culprits. So the secret to eating less throughout your day is to snack on foods that satisfy without overloading you with calories. Below are two healthy snacks that we think accomplish exactly that — they satisfy hunger without busting your waist size. Give them a try! Boiled young soybeans are called Edamame in Japanese. These tasty little pods or individual beans are loaded with protein and fiber, but they have much less fat or simple sugars. What makes them so satisfying is their protein content - they pack a whopping 17 grams of protein in just a couple of handfuls. 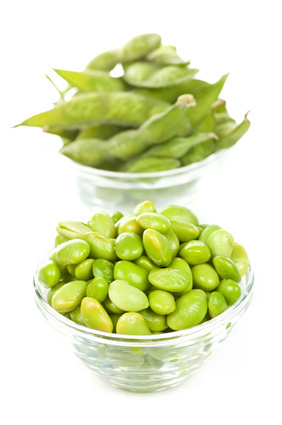 Edamame provide less than 200 satisfying calories in a simple, perfect little snack. The key point here is that they fill you up. About a half a cup and you’ll probably be all set until your next big meal, two or three hours later. The soybean’s nutritional cousin is the chickpea. Grind a few handfuls in a food processor with olive oil, salt, crushed garlic and a squeeze of lemon. Include some lemon zest to enhance the flavors and voila … hummus! That’s really all you need. Some chefs like to add tahini, which is sesame seed paste, for added flavor, but we’ll leave that choice to you. The nutritional content of a chickpea is very similar to that of soybeans, except that everything including calories and sugar content is slightly higher. 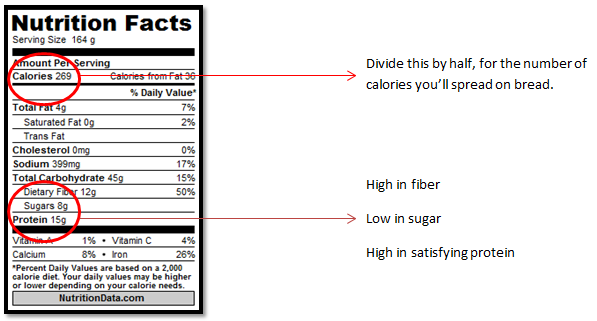 But keep in mind that the total number of calories and total amount of sugar is for a full serving. You will only use about half of a serving to spread on bread. One of the most nutritious “vehicles” for eating hummus is sprouted grain bread. What is that? Sprouted-grain bread is made from wheat kernels, often called wheat berries, which are allowed to sprout and then are ground up and baked into bread. Because the kernels are not ground into flour, such breads are often referred to as "flourless." Sprouted-grain bread is very nutritious and provides higher amounts of vitamins, minerals, and fiber than most other types of bread. Sprouts can be made from an array of grains and legumes, which can provide a complete set of amino acids — the building blocks of protein. One slice of sprouted-grain bread will add about 100 calories, 2 grams of sugar, 5 grams of protein, and 3 to 5 grams of fiber to your prepared hummus spread. This snack will definitely satisfy without significantly increasing your daily calorie intake. Will you give these satisfying snacks a try? Do you have a favorite snack you’d like to share with us? Let us know in the comments below! I'm concerned about two issues with edamame - their potential for estrogenic activity, and the fact that most soy is genetically modified and may be hazardous to our health. Those two issues prevent me from considering edamame as a healthy snack. I agree with Kelly B. I have heard much lately about the estrogenic effects on the male body, including the formation of woman-like breasts. 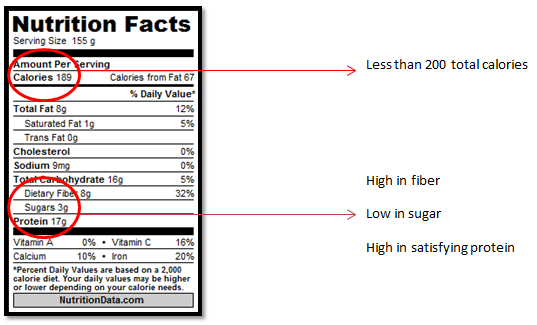 More research is coming in all the time that discuss the negative health effects of soy. This is in addition to the GMO part of the equation. As far as I know, 91% of all soy grown, at least in the U.S.A., has been geneticallly modified, so that every time we eat it, we ingest, basically, Monsanto's Roundup—not what I'd want to put first on my list of dietary supplements. Apparently, doctors, dieticians, nutritionists aren't getting the message, as i keep hearing them all tout the great benefits of soy. However, fermented, non-GMO soy may actually be good for the body, but it is hard to come by, as tofu (fermented soy) sold in the U.S.A. isn't really fermented, from all I have been able to discover. Possibly you might find some at a real Chinese market, but that's not even guaranteed.